Failure can be one of the scariest things in life. We create a plan, work really hard to achieve it, and in the end sometimes find ourselves with nothing left to show but sweat and maybe a few tears. In fact, this is a wonderful process that we can learn from. However, I’m going to be realistic and just say that failure does not feel like a wonderful process by any means. It is often painful and can damage our egos. But it gives us something to learn from. In this article I’m going to explain my mindset on failure and how you can start feeling great even when you fail. One of the first beliefs to internalize is that failure is absolutely necessary. It is impossible to succeed without making mistakes. Success is not the opposite of failure. Success is simply on the opposite side of the coin from failure. 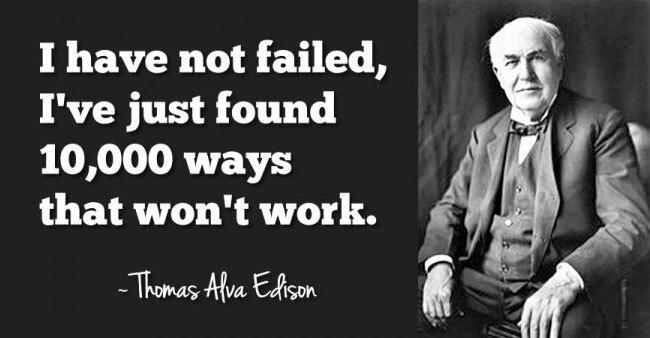 Remember that success results from many failures. Rarely do many successes come from one failure. Let me illustrate this point. Do you remember what it was like to learn to ride a bike as a kid? I seriously doubt many people got it their first time. On the other hand, I am fairly certain that there were a lot of scraped knees and bruises along the way. Only after repeatedly trying did we finally learn to ride the bicycle without hurting ourselves. Success was a result of repeated failure. Of course, this is an easy thing to do as a kid. Our egos are not quite so developed by that point. It is not a blow to who we are as successful people. So one characteristic of children is that they fail spectacularly. Notice that they are also spectacular learners. They grow and change more in a few years than most adults do their entire lives. This is no coincidence. Understanding that failure is necessary is only the first part of the formula. The second involves the real work, and is something that can’t simply be learned – it must be practiced. This is what separates the weak from the tough. It is easy to intellectually understand that failure is an important aspect of growth. This is not new by any means. But to hold on to that understanding while your world is crashing around you takes true guts. And that’s what I want to convey in this section. As with all things in life, try to smart small. Try to maintain your internal vision the next time you fail on a small level. An example of this might be a dinner date you were supposed to keep. Suppose you had plans with someone and really, truly intended to be there. And then something came up. And you did your best but could not make it. You might feel a little guilty for breaking plans with your friend. You might feel like, even though you did your best, you still failed on some level. This is good. This is when you practice maintaining your vision. You had a goal: to go to dinner with your friends. Something came up, but you did your best to deal with it. So it was not your fault that the plans fell through. Sometimes, life happens. Next time you’ll be more prepared for unforeseen circumstances. You have learned from the event. Rejoice! Now let’s take this process and try it with something larger. Suppose that your intent was to find a suitable long term partner. And suppose that, in the end, it just didn’t work out. You made some mistakes and they made some mistakes. Ultimately you found out that you and your would-be partner were simply not compatible. If this were a years-long relationship then you might feel a profound sense of failure. Perhaps even more so if you were married and had children. Now, let’s apply the process. To find a long term partner. Did you do your absolute best to make it work? Chances are that you did. You may not have always acted your best – who does? – but if you really wanted it then I am sure that you put quite a lot of effort into the goal. The first question is a very popular one. The second question is often very rare. If you are an astute observer you will find that you can learn a lot from almost any failure. That’s the magic of it. If you failed, then you did not do something right. Now it is time to try something new. On the other hand, success teaches you very little. You simply did something that worked. You can continue to do what works but you won’t necessarily grow from it. Instead, choose to challenge yourself and learn. Yes, it will hurt a little up front, but you’ll be much richer in the long run because of it. Learn to love to fail. nice post. I’m also, a firm believer in trial and error. I think that it’s important to continue going forward not matter what. In blogging, I just keep writing and keep publishing – whatever feels like coming out that day. It’s working wonders, and I’m trying to encourage others see the same truth. Hey Fred! Thanks for a very insightful guest-post. The core message again is: Keep focussed on your vision in face of failure. If you manage this, everything becomes a stepping stone towards that vision. A little setback is indeed something to be course-corrected on and a learning experience. I’m not 100% sure about success teaches you very little. Success teaches you what works. So you can do more of it. For instance this will let your relationship deepen, your business grow. And while it grows, you grow to higher challenges, or other quality of problems. Besides, everyone needs some kind of little successes from time to time to build on. I think failures and successes go together, to create something larger eventually.